For the office holiday party this year, I dug deep and pulled up a dessert that was recommended to me years ago (I think 5 years ago) by a co-worker, back when I wasn’t making much more than cupcakes out of Martha Stewart’s recipe book. It was fun to see this dessert in a new light and realize how much more complex and interesting it is to me now. 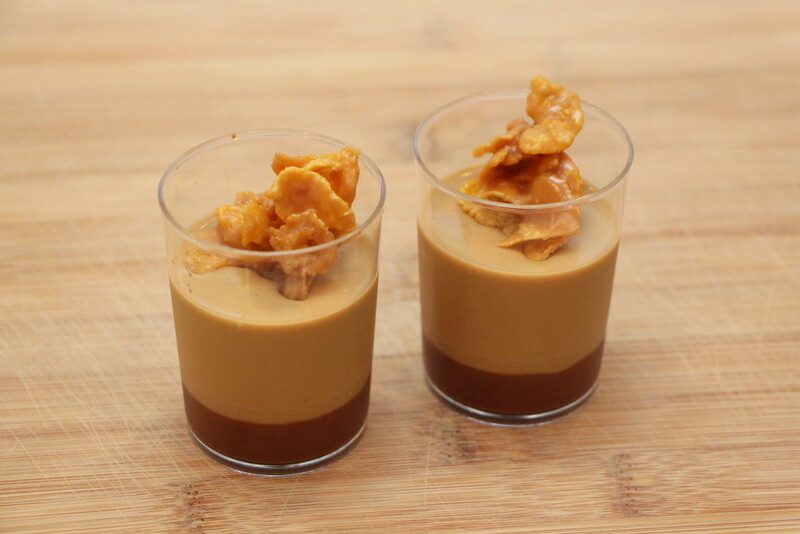 This dessert from Herbivoracious is comprised of butterscotch pudding with chocolate ganache on the bottom, and butterscotch (caramelized white chocolate) cornflakes on top. The ganache is bittersweet and creamy, the pudding slightly smoky (I might even call it a caramel pudding instead), and the cornflakes are coated with a sea salt caramelized white chocolate hazelnut ganache. It’s a bit of work to make all of these components, but if you’re familiar with ganaches and custards, it should be straightforward. And the results are worth it! 1. Heat heavy cream in sauce pan until nearly boiling. Pour over chocolate in a bowl and let sit for a few minutes. 2. Whisk until smooth, then pour into cups. Place in fridge to cool. 1. In a small bowl, whisk cornstarch with ¼ cup of milk to form a solution. In a separate medium bowl, whisk together egg and egg yolks. 2. Put the butter and brown sugar in a medium saucepan over medium-high heat. Cook, stirring occasionally until the butter is melted, then reduce heat to medium. Continue to cook, stirring occasionally, about 7 minutes, until fragrant and starting to caramelize. 3. 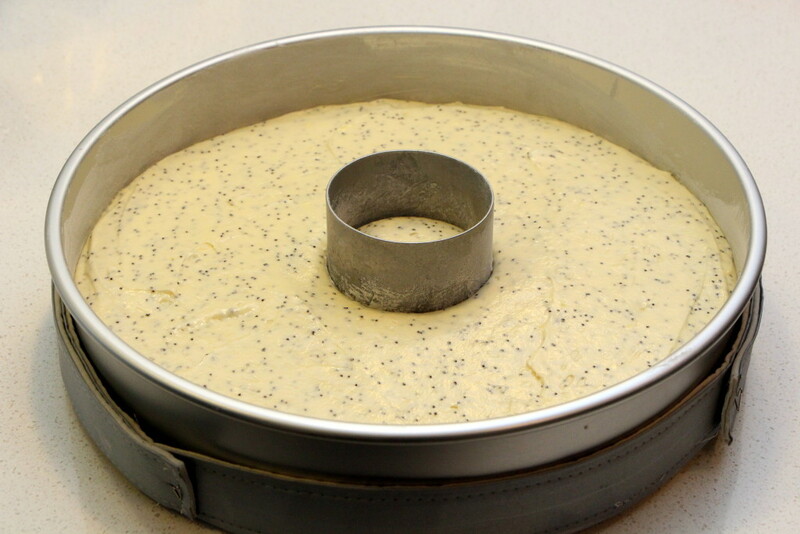 Remove from heat and carefully stir in a pinch of salt, the vanilla extract and the remaining milk and heavy cream. The mixture will sputter and the sugar will seize up. Place saucepan back on medium-low heat and cook, stirring frequently, until it reaches a simmer. The sugar should dissolve. 4. Pour a third of the hot mixture over eggs while stirring to temper, and return egg mixture to saucepan. Continue cooking over medium-high heat while stirring constantly for about 2 minutes. 5. Whisk the cornstarch solution into the saucepan and cook for one additional minute until the mixture thickens further. Turn off the heat. 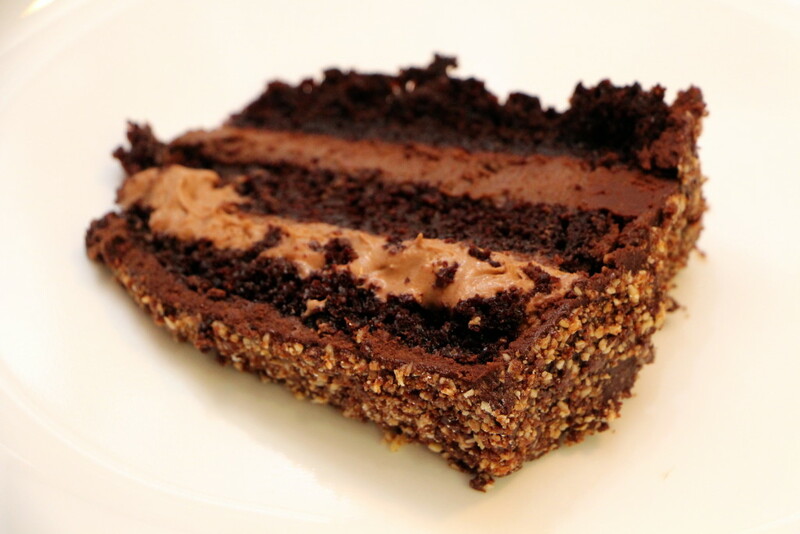 Use an immersion blender to process the pudding until it is completely smooth and uniform. 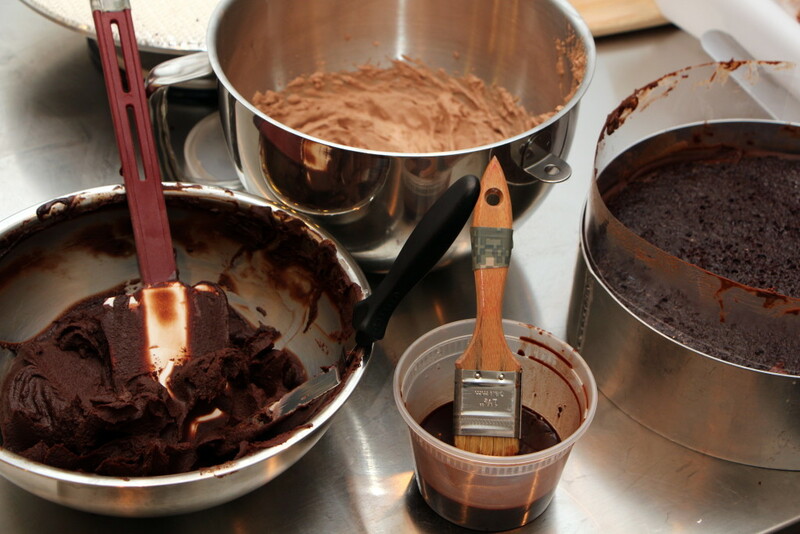 Allow to cool somewhat (but before completely set) and pour on top of the cooled ganache. Cover and return to fridge. 1. Toast the cornflakes on a sheet pan at 300° F until fragrant and lightly browned, about 5 minutes. 2. Seal the white chocolate in a canning jar. Put in pressure cooker with enough water to cover the jar and cook at high pressure for 20 minutes. Release pressure. Carefully remove jar and allow to cool until you can handle comfortably, then open the jar. [Note: I used a standard pint jar which just barely fits into a standard stove-top pressure cooker when placed in the middle, tallest part of the pot, but it worked.] The chocolate will look light brown and seized up. Transfer it to a bowl and break it up with a fork. 3. Heat the heavy cream in a small saucepan until nearly boiling. Pour majority over the white chocolate, whisking until melted and smooth. Continue adding heavy cream as needed (you want to use as little cream as possible to avoid wetting the cornflakes, but enough to create a stirrable ganache). 4. Stir in the hazelnut butter/paste and the salt. Taste and adjust seasoning. 5. Toss the chocolate mixture with the cornflakes. 6. 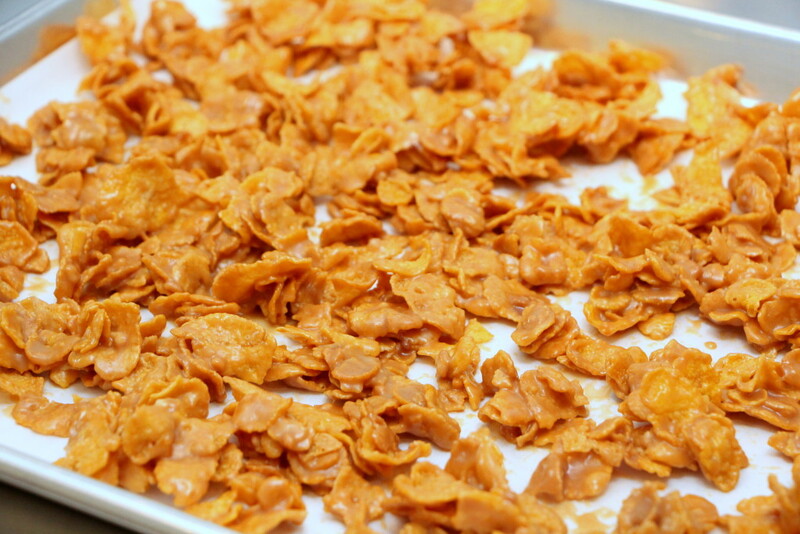 Spread cornflakes out on a parchment-lined sheetpan, allowing small clusters to form. Let cool in fridge to set. When the pudding is set and ready to serve, top each pudding with a small handful of the cornflakes. For Thanksgiving this year, I got a request for a chocolate dessert. So I took the opportunity to make one of my favorite very very chocolatey desserts, the Viking cake from Extraordinary Desserts. 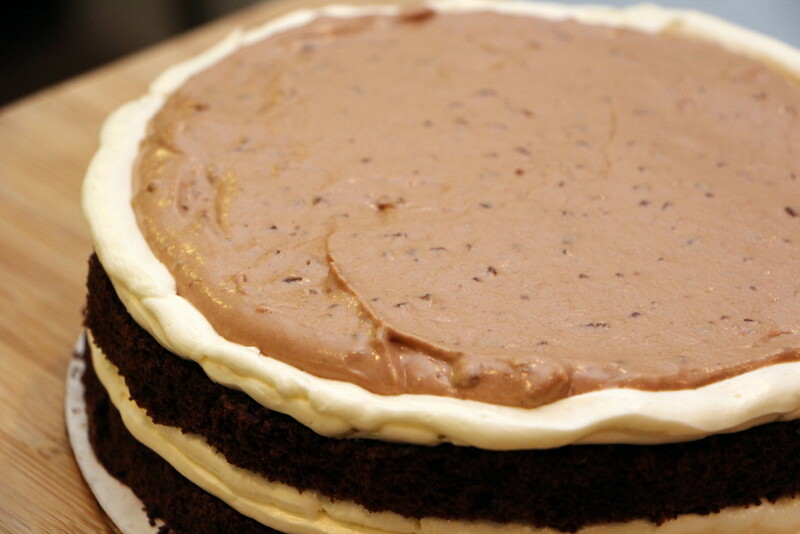 This is a 3-layer chocolate sour cream cake, with a dark chocolate creme brulee filling, as well as a milk chocolate chantilly cream filling. 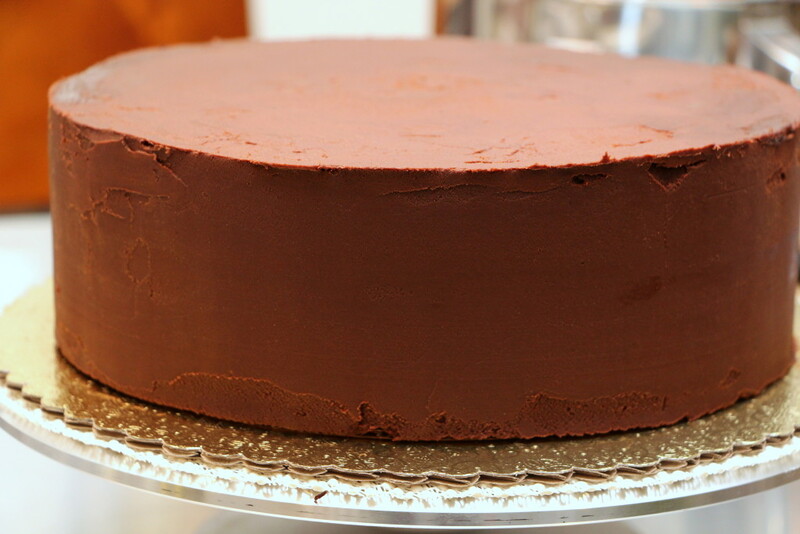 The cake is also brushed with cocoa simple syrup and lined with ganache. 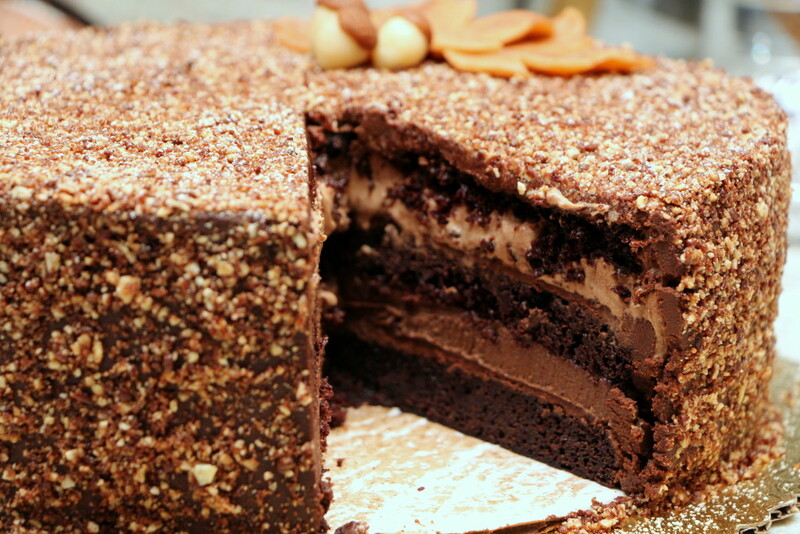 Finally, the cake is covered with the ganache and crushed cocoa almond praline. 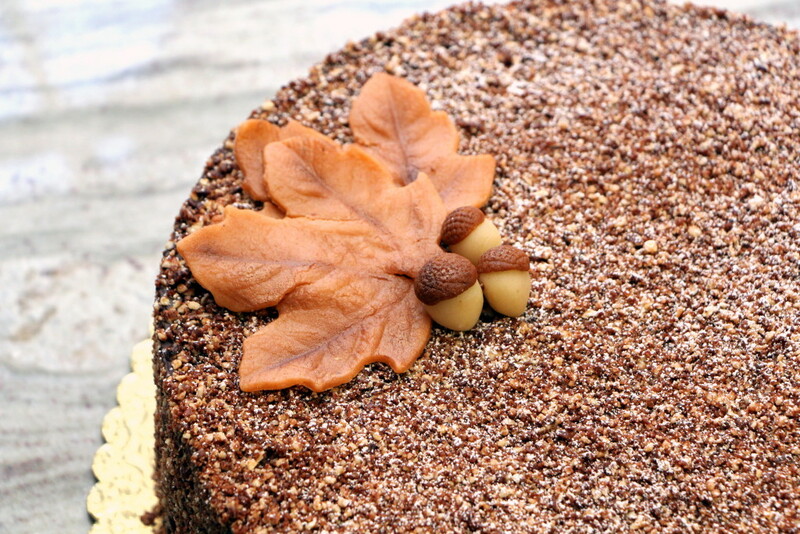 For decoration, I dusted the top of the cake with powdered sugar and made some marzipan autumn leaves and acorns. Baby Shower | Congrats Roxana & Al! 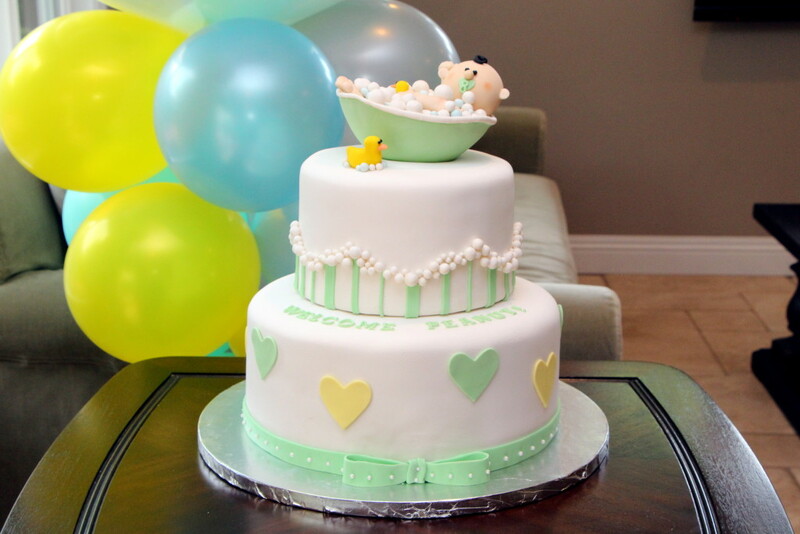 You can’t help but smile when you see this two-tiered baby shower cake. Although the design is based on photos of cakes from a New York bakery (provided by the sister of the expectant mom), I was still offered creative license, and there is something fun and challenging about figuring out “how they did it.” Sometimes customers give me basic directions and entrust me to make something interesting, and other times, they have a very specific image or idea in mind. I’m happy to make it happen, either way! 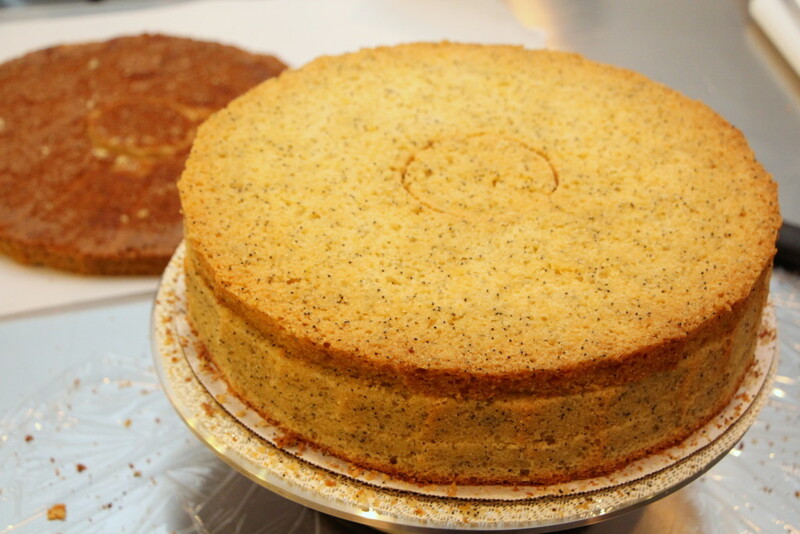 The bottom tier is a 12″ citrus poppyseed pound cake, with lemon curd and pastry cream custard filling. 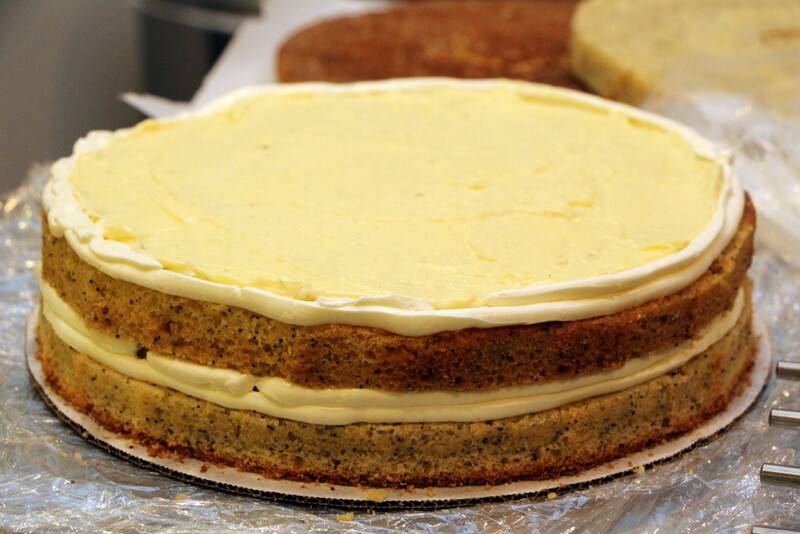 I say “citrus” because I used primarily grapefruit juice, with some lemon juice, to flavor the cake itself. 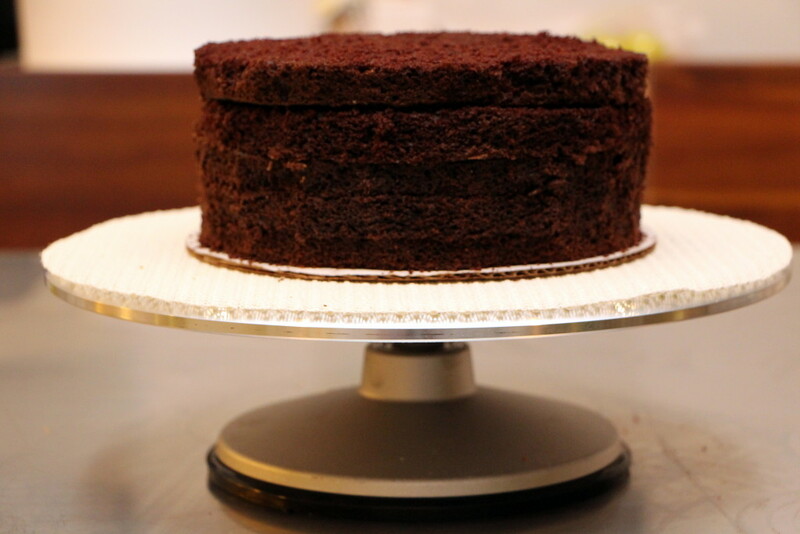 The pound cake made for a hefty cake. We sure got our workout moving this piece around. 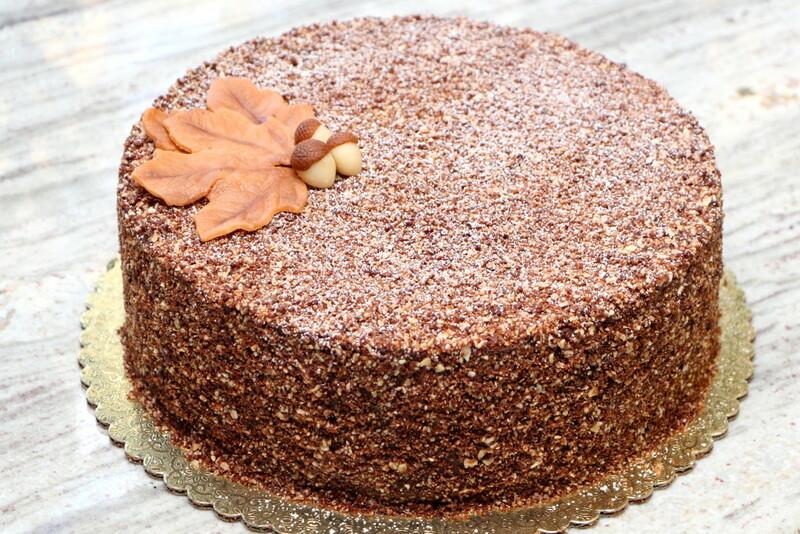 The top tier is an 8″ chocolate layer cake with alternating layers of dark chocolate mousse and milk chocolate mousse with chopped milk chocolate bits. The expectant parents told me this reminded them of their favorite “Bibi’s cake” from their hometown of Iran, that they’ve searched for but haven’t found in the past 12 years in the US. Lucky coincidence perhaps, but what a compliment! 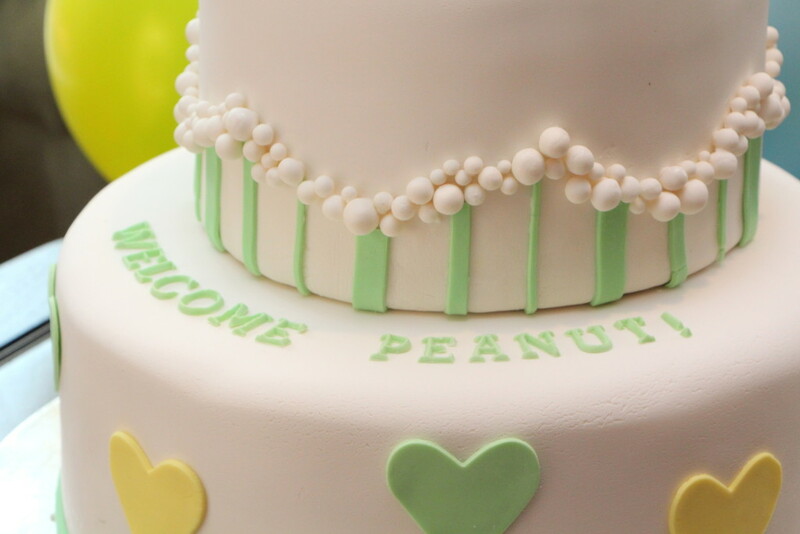 The cake is covered in fondant, with fondant-gumpaste decorations. This was my first time using tappits for lettering, and it was easier to use than expected. 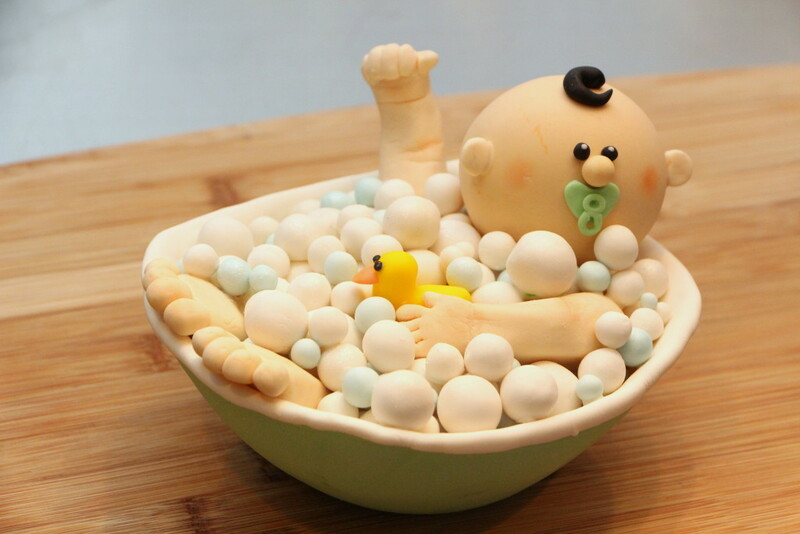 As for the cake topper, the baby bath was made first by molding gumpaste in a bowl, letting it dry, and then covering with a thin green fondant-gumpaste layer. 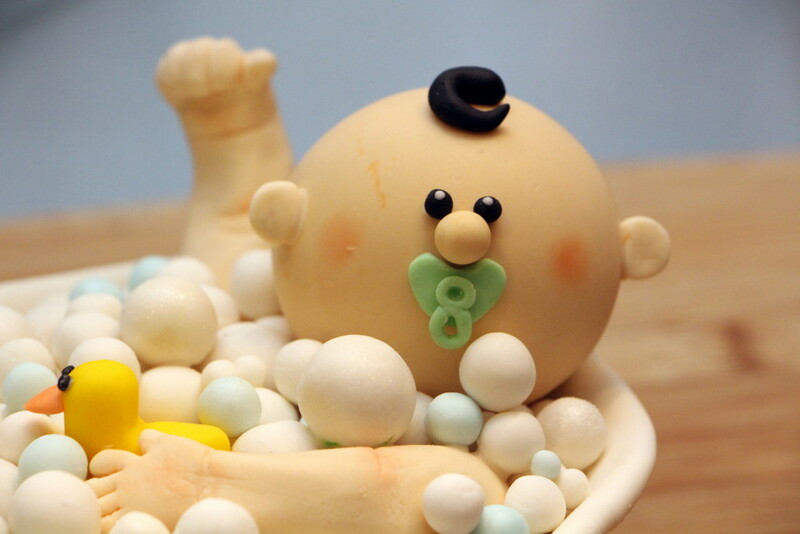 I placed a concave disc of gumpaste inside the bath to take up volume (without adding weight) and prop up the baby’s head, feet and arms (yup, there was no body or legs . . .). Then, I individually glued white and blue “bubbles” with royal icing to fill in the bath. Finally, I dusted a few bubbles with pearl luster dust to add dimension. As you can see, the baby’s head was a bit heavy. 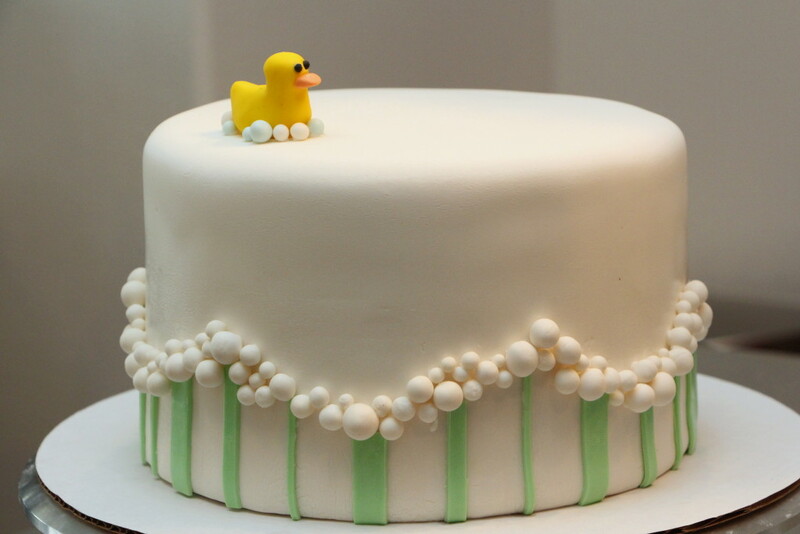 Once placed on the cake, the bath depressed into the cake on one end. I was a little stressed about whether it would keep sinking, but I hear it held up just fine. Also, depending on who you asked, it might have ended up looking better that way!